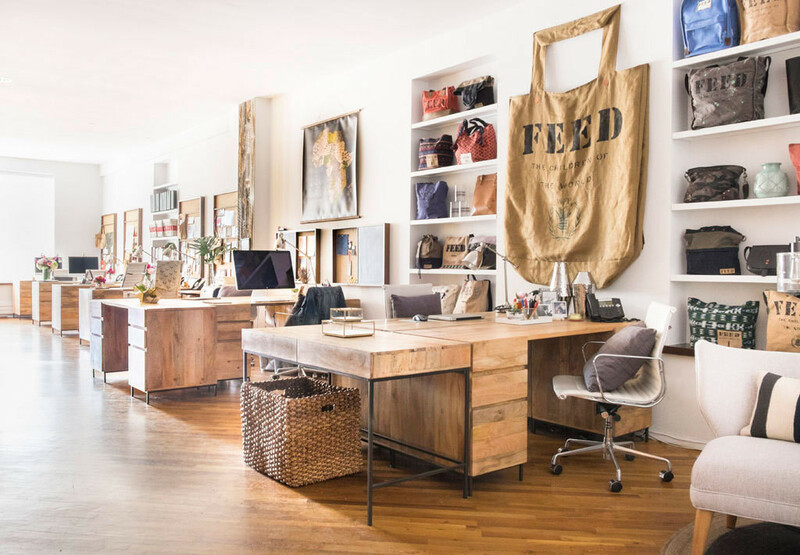 With a growing team and ever-expanding charitable ventures, FEED Project's New York City headquarters got a much-needed makeover courtesy of West Elm. Back in 2005, Lauren Bush Lauren—the now model-entrepreneur who launched a thousand million tote bags—was a student spokesperson for the United Nations’s World Food Programme. Moved by the hunger crisis she witnessed on her travels around the world, Lauren decided to help the cause by designing a simple cotton-burlap bag, the sale of which would provide meals to a child in need for an entire year. Nearly a decade later, that one design has grown into a collection, an organization, a staff, a cramped apartment headquarters—and fed into a movement aimed at creating ethical, eco-friendly products that were also undeniably stylish. Lauren’s simple, chic design and fashionable background caught the eye of not only philanthropic shoppers, but also a stream of fashion-forward collaborators, including DKNY, Tory Burch, Target, and Toms. 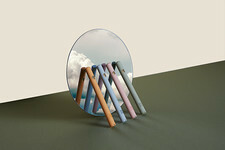 Last fall the company branched out into home decor for the first time with a tabletop collection sold at West Elm. The line was an extension of the FEED Supper Initiative, which had philanthropists hosting pop-up dinner parties around the world, feeding 1.6 million people in need in the process. 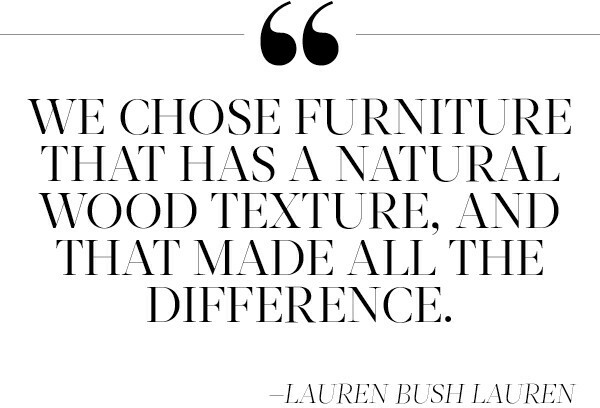 "West Elm is truly a like-minded partner," says Lauren. "It’s been a really fun and seamless collaboration." 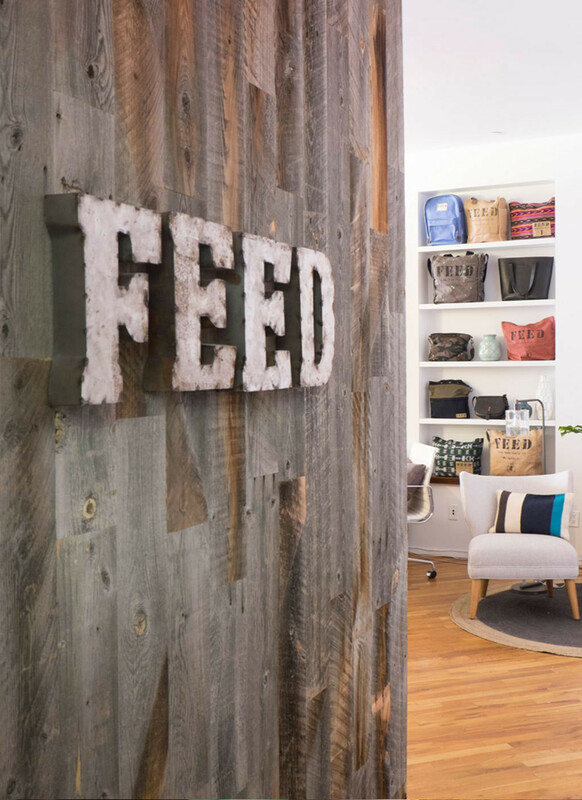 A reclaimed-wood wall bearing the organization's logo greets visitors to the office. 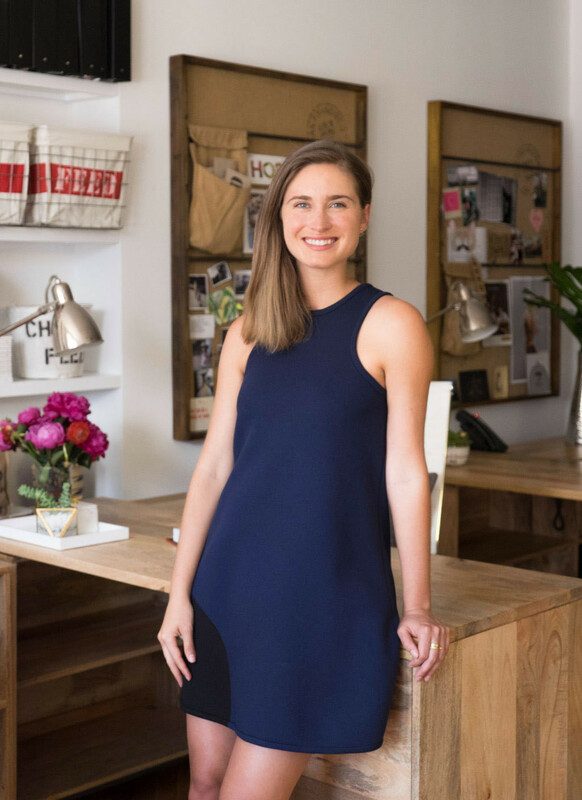 Founder Lauren Bush Lauren in her refreshed office space. That relationship would prove even more essential when the FEED staff found themselves struggling to make their New York City office space functional with an ever-expanding team. “We had some Ikea furniture and some makeshift stuff that had been cobbled together from when we were still working out of my apartment," explains Lauren, an admitted decorating enthusiast. "We were all sort of hunkered against the walls. It was clear we just needed to rethink the use of the space." So, she called on the trendsetting brand for a little professional assistance. 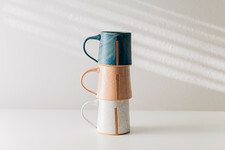 The new decor mixes FEED's simple, rustic accessories, West Elm's signature sophisticated furnishings, and tabletop items from the brands' collaboration. The task she set: 1) Fit everyone in. 2) Give them the space they need to grow and be creative while keeping everything within the FEED aesthetic. “We all spend so much time [here]," she says. "I believe it’s really important that the place you see every day be beautiful." Enter West Elm stylist Johanna Mele, who also helped the brand redecorate Gracie Mansion, the official residence of the Mayor of New York, and the apartment of Saturday Night Live's Cecily Strong. “The original layout wasn’t using the precious NYC square footage to its full potential,” she explains. The offices and conference rooms that line one side of the narrow space were perfectly functional, but the open area, where most of the FEED staff sits, wasn’t cutting it. 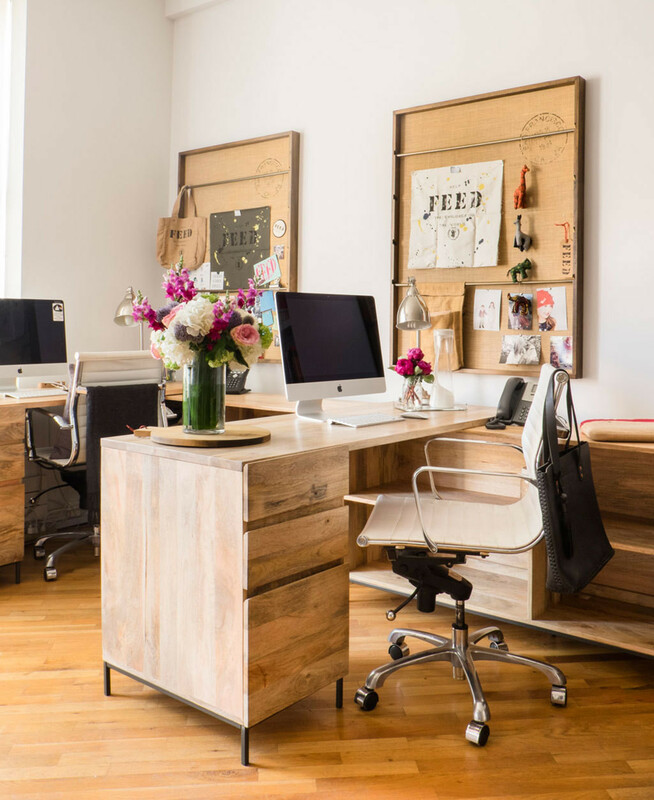 Desks from West Elm's Industrial Modular Office collection sport FSC-certified mango wood and gunmetal accents. 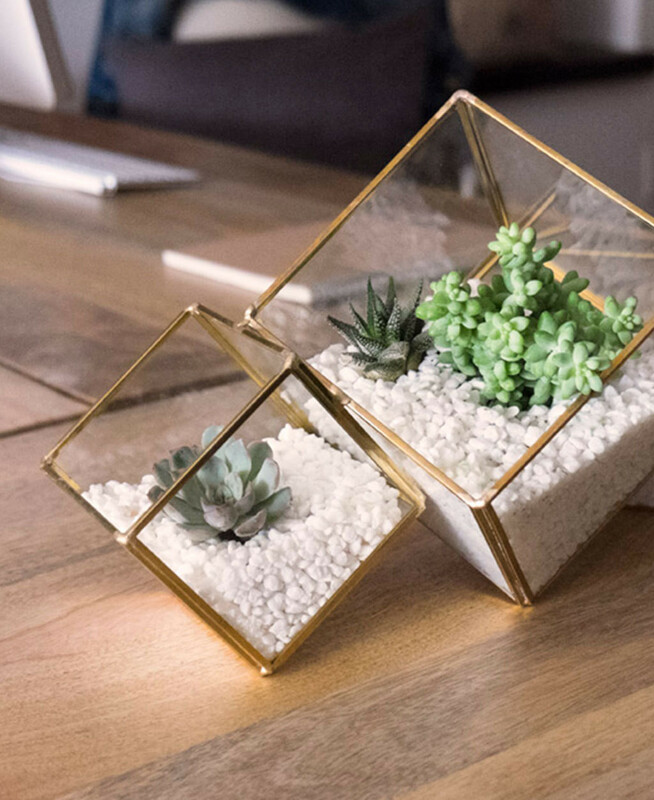 West Elm's gold faceted terrariums hold low maintenance succulents, perfect for an office space. By shifting the desks to be perpendicular to the wall, Mele created a multifunctional layout perfect for meeting and collaborating, plus more room for all kinds of necessary storage.“Lauren immediately gravitated to our Industrial Modular Office Collection," Mele says. "The raw mango wood paired with gunmetal accents mirrors FEED’s style, and comes in various configurations.” The stylist also exiled the lounge area’s hefty sofa to the behind-the-scenes storage space next door, allowing more room for additional desks to accommodate the growing team. “The new lounge is smaller but just as functional. We chose a round rug instead of a more traditional rectangular one, which helped soften the overall look and feel of the entryway,” she explains. In decorating this office, Mele wasn't just designing for the staff, she had to consider the host of special visitors that pass through the doors. "When guests come in they just immediately get a sense of the brand, which is essential when you’re meeting with potential collaborators and partners," says Lauren. "The first thing you see is the wood wall with the FEED sign, and a little seating area to have them wait and be comfortable. It’s really not super fancy. It’s natural and woody, yet mature and polished." Recessed shelves showcase the organization's myriad bags and accessories, while the West Elm accents lend a sophisticated, urbane vibe through the use of glass and metallics. "We also added in a layer of greenery," says Mele. "We styled the terrariums with simple white rocks and succulents, which is a great, low-maintenance way to add life to a space." 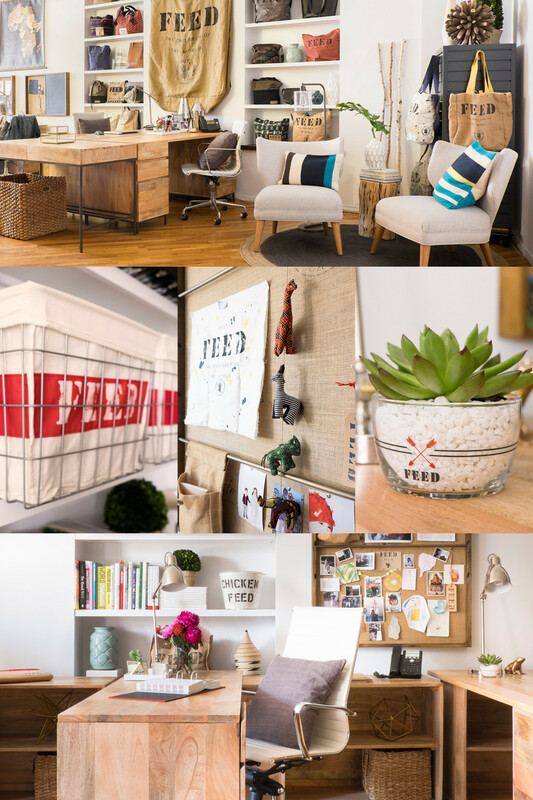 After all, how could you not give a little life to an office that quite literally saves them?